Home OVULATION Can You Ovulate While Pregnant? Can You Ovulate While Pregnant? Before asking can you ovulate while pregnant, it is important to find out about the ovulatory cycles and about the way fertilization takes place. As a result you will understand what happens with your body and you won’t have to ask questions of this kind anymore. During each month there are eggs in follicles preparing to be released from the ovaries. There is only one egg that bursts free from the follicle and it travels down the fallopian tube. The follicle will become the corpus luteum that releases a kind of hormone which makes the endometrium thicken, preparing for pregnancy. If you are considering pregnancy and ovulation it is good to know that the released egg waits in the fallopian tube to be fertilized for about 24 hours. If fertilization doesn’t take place, it disintegrates and it is cleared along with the endometrium that sheds. This is known as the menstrual period. When asking can you ovulate while being pregnant you should know that if there is a sperm that burrows into the egg, it means that the egg gets fertilized and conception takes place. After this the cells of the egg start dividing very fast. For the following 3-4 days the egg stays in the fallopian tubes. The women interested in ovulation during pregnancy should know that after this the egg travels to the uterus and it gets implanted into the uterus’ lining. This is known as implantation. At this point some women notice a bit of bleeding or spotting. The body starts producing human chorionic gonadotropin and you will test positive for pregnancy. In case you are asking can you ovulate while pregnant, remember that during this phase there are several different kinds of hormones released by the body, including progesterone and estrogen. Some of these hormones have the role of stopping the ovulatory cycle so that there will be no other eggs released. 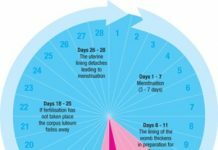 Why is ovulation during pregnancy impossible? Let’s suppose that ovulation while being pregnant is possible. So the egg travels down the fallopian tube and it doesn’t get fertilized. The next step would be for you to have your period, which is simply impossible. The lining of the uterus cannot shed since there is already an embryo embedded in it and the lining is really thick. On the other hand, when asking can you ovulate while pregnant, you should consider why this is impossible. The egg can’t be fertilized because the mucus plug inside the cervix opening doesn’t allow sperm inside. Ovulation when being pregnant isn’t possible because an egg can’t get embedded into the uterus if there is already another egg there. If this was possible it would mean that you would have two babies with different due dates. You can see that it is impossible to ovulate when you are already pregnant. As you can see the answer to the question can you ovulate while pregnant is that it is impossible. Previous articleCould co-Q10 help you conceive?